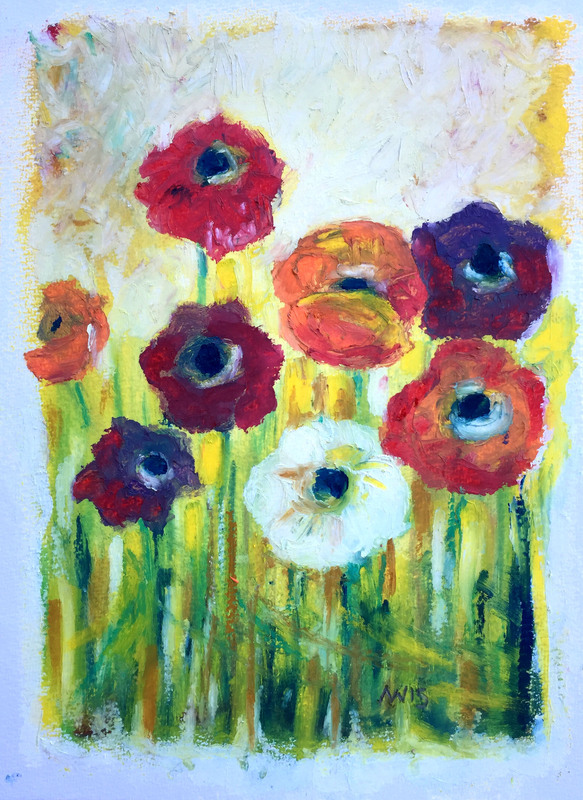 Loving the oil paint sticks! I got a starter/student set of Shiva oil paint sticks to try while on vacation. The color selection is a little primary…but that is good to learn with. I also got a set of mini iridescent oil sticks–they are very nice colors and not too metallic. Working on paper is actually very nice with this medium and it dries pretty much overnight. Dry enough to close my journal anyway. I love the fact that the sticks are kind of chubby, so it forces me to stay loose. I have gone into little spaces with a brush as well. The Shiva product is not as buttery as the R&F that I was using at home. I like the quality of the Shiva for paper…I think that the R&F will be better for canvas. Study 4×6 for painting. The tail is too big! Playing around with some small studies–working on a larger painting from the small study. Interesting feeling going from paper to canvas. Beginning of larger painting with oil paint sticks on canvas. 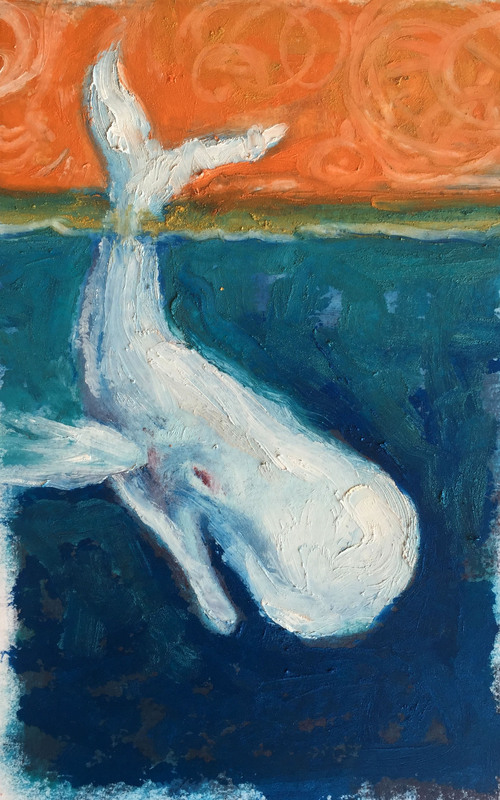 This entry was posted in art, art journal, flower, oil paint sticks, whale and tagged art, art experiments, flowers, journal study, oil paint sticks, whale. Bookmark the permalink. So beautiful .. good work. I like both small pieces. 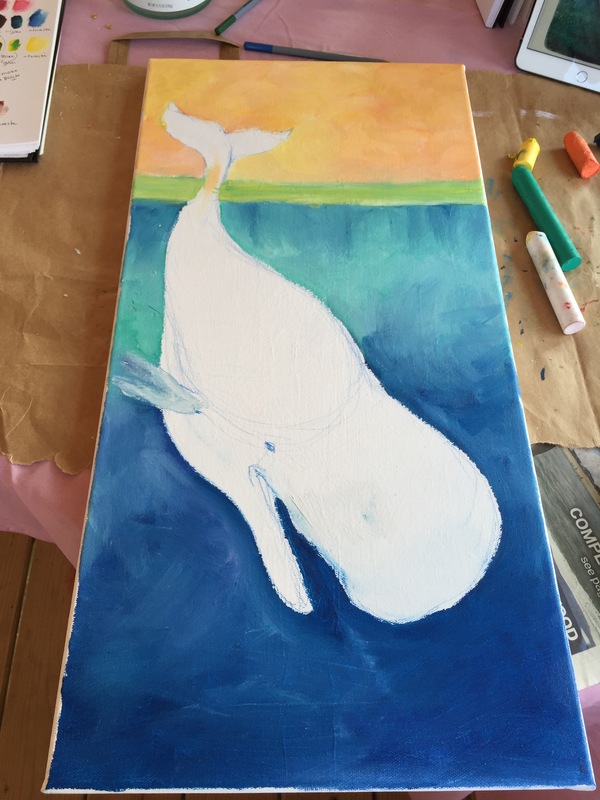 I don’t think the tail is too big on the small whale piece. It looks right to me. What kind of whale is it? I’m not fond of big pieces, but I know you want to decorate your beach home with larger pieces. At least I think that is why you are doing the big pieces. If the whale is a sperm whale then you might be right about the tail being too big. I had to look it up! I don’t actually know what kind of whale it is Mama. I think that the tail is too big because of the perspective. The larger painting is proportioned better. And, yes, you are right, I am working larger because I am doing artwork for the beach house. But, I am finding that the larger size is fun too!